Posted on January 22, 2015 by Bricia Lopez and filed under Travel, VIDEOS and tagged LiveOaxaca. I often receive calls and E-mails from friends asking for my recommendations on places to visit and eat when traveling to Oaxaca. So I finally decided to compile a list of my favorites places to eat, drink and lodge when making that amazing trip down south. I also always recommend my boy Oaxacking as a personal tour guide. His rates are very reasonable and it is always a great idea to have a local show you around anywhere you travel. We always roll together when I am in Oaxaca, so he knows all my favorite spots and routine. I highly recommend you hire him for at least a couple of days during your stay, I promise, you will not regret it. Now, for my recommendations… I will always recommend visiting Oaxaca during the Guelaguetza season (last two Mondays of July), and for Day of the Dead (late October/early November). Oaxaca can get pretty crazy during these two occasions so I highly recommend booking everything early and making dinner reservations in advance. Even though the city can get some what chaotic during this high season, it’s an unforgettable experience. The city is vibrant with colors and there is always something to do around town. But again, it can get prettyyy crazy. My absolute favorite time of year to visit Oaxaca is during El Saber del Sabor food festival in late November. This is the time of year when the who’s who of Mexican chefs visit Oaxaca and come together for 10 days of cooking demos, tastings and pre-fixed dinner collaborations. The weather is always great during that time of year as well. Not too cold, but not too hot either, though you might get some rain, so just pack accordingly. Another great time to visit is early to mid March. It can get a somewhat hot, but nothing too unbearable. The city is beautiful at this time of year, and since there aren't many tourists around, you can really get the pulse of the city. The beach is always a great place to visit anytime of the year, and if you are going to make that trip, I recommend staying at Zoa in Mazunte, a town 45 min away from the Huatulco international aiport. I fell in love with this place from the first time I visited and wouldn’t stay anywhere else. The food, the atmosphere, and the staff make for the perfect relaxing vacation. You can book a flight from Oaxaca to Huatulco through AeroTucan , a 6 passenger plane, or fly directly to Huatulco from Mexico City. Safe Travels and don't forget to hashtag any of your Oaxaca trips with #liveOaxaca so I can be part of your experience too! Casa Oaxaca- $$$ Casa Oaxaca is a beautiful boutique hotel with 5 star service owned by Alejandro Ruiz, one of the best chefs in Mexico. Everything about this place is perfect…the food, the ambiance, the service. Every morning, the chef de cuisine goes out to the local market and comes back with fresh produce to make the menu for the day. Camino Real –$$$ The architecture is stunning. This hotel chain is walking distance from Santo Domingo, and the andador turístico. Hotel also has a pool, so its great to just relax on a sunny day. Las Bugambilias-$$ A super cozy B&B. The location is great, as it is very close to La Mezcaloteca, another favorite place of mine you will read about later. Their restaurant on site is La Olla, one of my favorite places for breakfast or lunch. El Secreto B&B –$$ A cozy and urban B&B, with the friendliest of staff. This B&B has four bedrooms, a private patio and beautiful sun deck. They also offer cooking demos and other services. La Betulia B&B - $ An affordable, clean and cute B &B. The staff is super welcoming and has great city insights. They also include delicious breakfast in the patio where you get to meet other guests and make new friends. It is located within a 10 minute walk from Santo Domingo. Suites Bello Xochimilco -$ A great alternative when traveling with a group of people. These are 2-3 bedroom suites with a kitchen and dining room. The location is not too bad either. It’s not in the downtown square, but its only a 20 minute walk and always a great way to work out your previous nights dinner. I recommend you pack your speakers and your own toiletries to make you feel right at home. Cooking class with Susana Thrilling- Susana is a dear friend of mine, and I HIGHLY recommend taking her cooking class with the local market tour. The school is like a beautiful oasis, located in Etla, a town 25min from Oaxaca. She is amazing and worth every penny. I would recommend that if you are interested in taking her class, you do it the first days you are there. You will learn so much from her. The class, including the tour is a full day event. She has a driver pick you up in the Oaxaca city at 9/10am and drives you back at6/7pm, so plan accordingly. Cooking classes with Rodolfo Castellanos- Rodolfo is without a doubt, of the best chefs in Mexico. His restaurant is in the top of my list of places to visit and I always eat there more than once every time I am in Oaxaca. He recently renovated his restaurant and is now able to host more cooking classes and Mercado tours. You can book your class directly on his website. Tosba Mezcal distillery– If you are feeling adventurous (and I mean being with out cell service for more than 12 hours on curvy Oaxaca roads) then this is, with out a doubt, the place to check out. It will take a few phone calls and arrangements, but if you’re serious about it send me a note and I can arrange it with the owners (best people in this world). Note that this will be a two-day experience. La Mezcaloteca - The ultimate mezcal tasting room. The name of the place literally translates to ‘mezcal library.’ Every person that works there is a mezcal expert and can guide you through an incredible tasting of my favorite spirit in the world. Make sure you call ahead and make a reservation. They do not take walk-ins. This is another place I recommend you visit on your first days there. You will leatn so much about mezcal, that it will make ordering at restaurants so much easier. Mezcaleria Los Amantes | Terraza Los Amantes – One of my favorite places to stop by before heading to dinner. This mezcaleria is a fairly small place with usually three to four mezcal varieties to chose from. Its inexpensive and an experience of its own. I recommend you stop after 8pm when all the regulars drop by. | Terraza Los Amantes is located right across the street from the mezcalria on the roof terrace of their newly opened hotel. I recommend you come here before dinner for an appetizer, cocktails, but most of all for the view. Sunset is beautiful from here. Sabina Sabe - This has become one of my favorite places for cocktails in Oaxaca. Here is where I first tried Oaxacan whiskey and where my husband and I love going on dates when we are in Oaxaca. Their mezcal collection is killer, but the star are the cocktails. The bartenders (ask for Rodrigo) are real craftsman and take their cocktail making super serious. Come here after having dinner for a night cap, or to grab a couple (or more) drinks and apps. Archivo Maguey - If you are looking for a fun night out with cumbia and mezcal, this is the place for you. The owner seeks out rare mezcal lots and curates the entire mezcal list himself. He is extremely knowledgable in mezcal and does and amazing job at crating a modern and unique space. Don't ask for cocktails though, only mezcal and cerveza are served. Tlacolula Sunday Market- Every Sunday, thousands of merchants from the valleys of Oaxaca gather in Tlacolula to create the biggest market day in Oaxaca. I suggest you arrive as early as possible. Bring comfortable shoes, cash and a hungry belly. I recommend you do all your souvenir shopping here. Tlacolula is 30 minutes from the city. When you are there, please make sure you grab your dose of Barbacoa Adolfa, my favorite stand in the market. Don’t be afraid to try anything, specially ice cream and tejate. Tacos de chorizo del Carmen Bajo – This is a little stand around the corner from the Carmen Bajo church. Try a taco de chorizo and another of Chile Relleno. Also, they have killer memelas. Ask any local about it, they'll guide you in the right direction. Tortas Lalita- One of my sisters favorite places to eat. I always bring her a torta back to LA when I travel. She recommends a torta de salchicha. The stand is near near Boulevard Lic Eduardo Vasconcelos and Alianza. Make sure you order a torta with Oaxacan sausage… that one is my absolute favorite. Garnachas on Constitucion – Here stands a woman who serves lunch on a street stand from 12 – 2pm. She sets up between Reforma and Avenida Juarez, half a block from Jardin Etnobotanico. She serves the simplest menu of Tostadas, quesadillas and tacos at its finest. Boulenc– One time, I ate here twice in one day. It's hard to describe boulenc without referencing Tartine in some way. Think of it as if Tartine had a Oaxacan love child and access to some of the best corn, fruits, species and herbs. 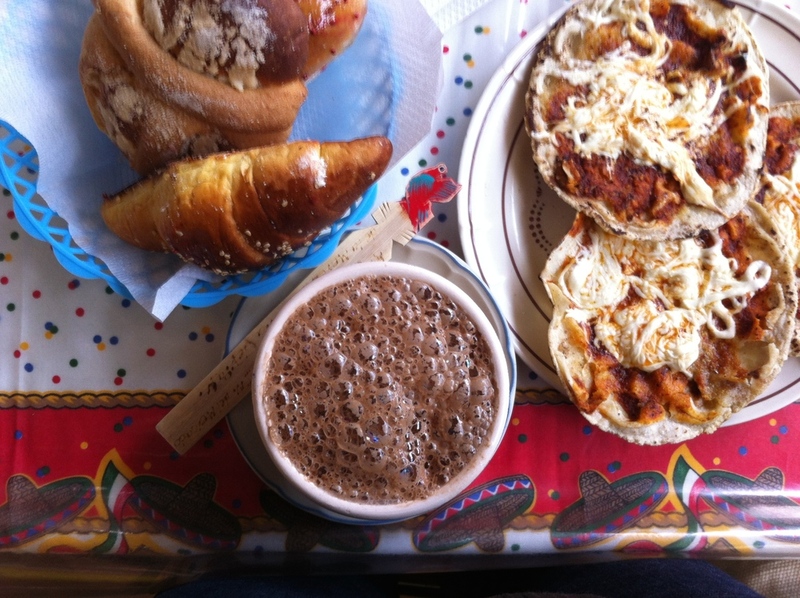 It's a bakery, cafe, bar all at the same time inside a beautiful old Oaxacan home. You must eat here. El Origen- Chef Rodolfo Castellanos struck gold in this place. This is not only a gorgeous location, but he is doing things in Oaxaca cooking that no other chef is doing. His menu changes throughout the seasons, so I recommend more than one visit to try it all (I always do) . Also, it is home to my favorite mezcal cocktail of all time. "el Picosito" which is a smoky, spicy, red margarita of sorts with a candied pineapple. La Zandunga – This restaurant is dedicated to serving food from the Isthmus of Oaxaca. This place is ran by two amazing brothers and their mom, who runs the kitchen. This is one of those places you can’t only go once. Be prepared to spend more than a few lunches there until you try the entire menu. They also carry Mezcal Espirituosa (again, be prepared to drink more than just a few of these). Their mom is also a designer and has a small little shop in the back of the restaurant where you can buy beautiful Isthmus textiles. Los Danzantes Restaurant- Beautiful décor. I recommend you make a night out of it. Start you night off with a nice dinner here and follow with some dancing and mezcal over at Café Central. La Pitiona- Voted as one of the best restaurants in the world by Conde Nast Traveler. Chef Jose Manuel Baños is the master of contemporary Oaxacan cuisine. Tlayudas Flavia - NO Oaxaca trip is complete without having a few tlayudas. This is where I get my tlayuda de falda fix. Completed with chepiche, rabanitos and some of my favorite salsas. it's a drive out from downtown., but so worth is! Gourmand Delicatessen- If you are looking for a delciuos sandwich on the go or a light dinner with a great glass of wine, this is a great spot. Barbacoa Dona Adolfa - I mentioned this on my market above, but she's worth having two mentions. You need to have these barbados tacos. Centro Cultural San Pablo - This is more than a museum, its an experience you need to see and feel. It's kid friendly and just beautiful. Museo Infantil Oaxaca - If you are traveling with children, you are going to want to spend a lot of time here. The playground is creative, modern yet keeps its organic and authentic feel. My son loved it! Monte Alban- The largest and most popular archaeological site in Oaxaca. Bring comfy shoes, because it's a hike! Mitla Sacred Archeological Site - Mitla was called the city of the dead back in the ancient times and it’s a great archaeological site. This is where I was born and where a lot of my family still lives. Its 45 min from the city, so you are going to need a driver. Right outside the archeological sites, are dozens of artesanos with great buys for nay gifts you want to take back with you. Hierve el Agua - I remember the times when my family and I would visit Hierve el Agua on weekends. We would get on our bathing suit, and get inside these hot springs and have the time of our lives. Through the years it has changed tremendously, but that doesn't mean its any less beautiful. The landscape is breathtaking and well worth the drive. It's very close to Mitla, so I recommend you make a pit stop while you are there. Ecoturism - If you love the outdoors, you need to experience the mountains of Oaxaca. From picking mushroom in Cuajimoloyas in the summer, to getting a limpia in the Centro de Salud of Capulalam de Mendez while eating fresh trout, the Oaxaca mountains have you covered. You can plan to stay overnight in either town, or plan to stay in one of the cabañas. Its a great experiences. They have zip lining too! Posted on January 9, 2015 by Bricia Lopez and filed under Travel and tagged LiveOaxaca Oaxaca.